Clachtoll Broch, Assynt » SPARKS WILL FLY ON SATURDAY! Author Mandy Haggith will talk and read from her novel, The Walrus Mutterer. 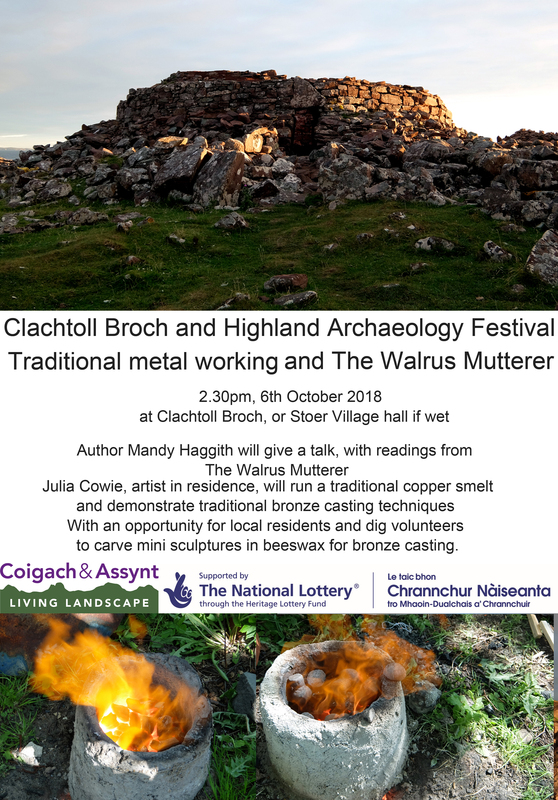 Julia Cowie, artist in residence, will run a traditional copper smelt and demonstrate traditional bronze casting techniques. There will be an opportunity for local residents and dig volunteers to carve mini sculptures in beeswax for bronze casting. 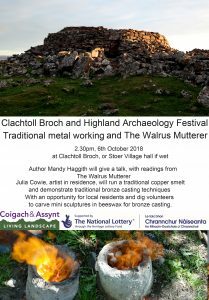 On Saturday 6 October 2018 we will have an opportunity to join in with Julia’s metal work and creation of a community sculpture at the Iron Age metal working event . Join volunteers at the excavation of the access to the Broch in carving wax discs for the community sculpture. These waxes will be cast in bronze at a public event on 16 November using primitive casting methods that the broch residents would recognise. Ullapool High school students recently helped Julia with a copper smelt using a pit furnace dug at the fank at Stoer. They crushed malachite and charcoal for the smelt balls and watched as the smelt balls from the fire were cracked open to reveal copper. There will be an opportunity to see this again on Saturday. This copper will be used in the bronze for the final sculpture. Lochinver primary school pupils who visited Julia have already carved their designs ready for casting in bronze. Several other people from Clachtoll and others with an interest in the Broch have taken waxes to give it a go. So far there are sea monsters and whales, seals and a horse, and several stars ready to cast in bronze. What design would you choose? Something from the Broch, the landscape, the Iron Age, or something that reflects the meaning of the Broch for you? Come along on Saturday and get involved! (Click image below for full size poster).